On Wednesday 19th October at 12.30pm, I’m going to be giving a free, short public talk in the Centre for Research Collections. The talk’s connected to an exhibition that we’re taking part in inside the 6th floor display wall in the Main Library. The exhibition looks at the work of an archive from another angle. You’ll often see archive treasures on display, from manuscripts to objects to images, but the hard work that goes into making these collections accessible –so that researchers can physically see them and that they can find what they’re looking for – all goes on behind closed doors…. The Enhance, Access and Understand exhibition aims to put his right, bringing behind-the-scenes conservation, digitisation and description out of the shadows and into the light (but not too much light – we have to be careful about our lux levels! We’re showcasing the work done throughout the Centre for Research Collections (CRC) that has been generously funded by the Wellcome Trust Research Resources scheme – grants to libraries and archives that help to make collections accessible to researchers by funding cataloguing, digitisation and conservation. Last week, LHSA Manager, Ruth, and Emily Hick (former Project Conservator for LHSA, now CRC Special Collections Conservator) hosted a successful talk and studio tour on the challenges involved in conserving LHSA’s HIV/AIDS collections, which are featured in Enhance Access and Understand. Emily explains some of the issues involved in this work here. On the 19th October, it’s my turn, and I’ll be focusing on the work that we’ve done in LHSA to catalogue a fascinating but under-used set of resources – 20th century folder-based case notes. If you’re a regular reader of the blog, you’ll know that we currently have two Wellcome Trust-funded cataloguing projects that are ongoing – one is cataloguing Professor Norman Dott’s neurosurgical case notes and the second concentrates on our substantial collection of TB case notes from Southfield Sanatorium, the Royal Victoria Dispensary and two Mass Mobile Radiography campaigns. Since there have been quite a few blogs on the content of casenotes, the methodology of the projects and even the differences between the two, I won’t repeat what’s already been written, but try to give my own angle on why I thing this cataloguing is so important. To say that I’m attached to case notes is probably an understatement. I started work here at LHSA as Project Archivist, cataloguing Dott’s case notes and now I supervise both projects as Archivist. In fact, I had my firstexperience of case notes as a volunteer for LHSA back in 2010. Looking at case records as a cataloguer both intriguing and intimidating. You gain a privileged view inside someone’s life at a time when they’re probably feeling at their most vulnerable (as we all are as patients), but there’s also a lot of specialist medical language in the cases and, when you’re not a medic, that can take a lot of deciphering! However, this ‘cataloguer’s view’ is unfortunately an all too rare one, since researchers do not use archival clinical cases as much as they might. 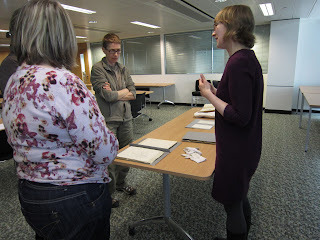 Louise as Project Archivist showing off some of her wares! The first reason is case notes’ physical condition – many are still in their original folders, which can be messy and loose on shelves. Fortunately we’ve solved this problem at LHSA thanks to Wellcome Trust grants that have funded conservation. However, by producing a catalogue to our case note collections, we’re overcoming the two main intellectual barriers to their use as well. First, case notes can be ordered by name, admission number or by ailment – if a researcher wants to find all cases featuring a certain condition, for example, in a set of case notes ordered by admission, it can be a lengthy process scoping hundreds if not thousands of documents. Secondly, since case notes are relatively modern archives, most are classified as confidential under legislation and NHS guidelines that cover health records of living and deceased patients. Even to see what information cases hold, researchers would need to apply for special permission – which can take time. Our catalogues hope to circumvent these difficulties by providing anonymised descriptions of each case in our neurosurgical and TB case note collections – so potential researchers can see what sort these documents have to offer. Because of the way in which we’re cataloguing the cases, we will also produce a confidential, identifiable catalogue that can be accessed by special permission by legitimate researchers in our reading room. Both catalogues label aspects of descriptions so that they can be searched under specific categories. Finding a way to describe these glimpses into the recent medical past certainly was a challenge, but has honestly been my career highlight so far! We’ve had a brilliant team working on both case note projects, and we’d love you to come along to learn more about how we went about ‘cracking the case note conundrum’ – there’ll also be a chance for a sneak peek at how entries in the public catalogue will describe cases before the project launch and an opportunity to see some case folders in the flesh. You can book your free places here: http://bit.ly/2dh9NPa. Royal Infirmary resident physician with Darby the cat, 1929 (LHSA photograph collection). LHSA has been a member of the Health Archives and Records Group (HARG) for a long while, and today is the second time in five years that we’ve hosted their AGM. 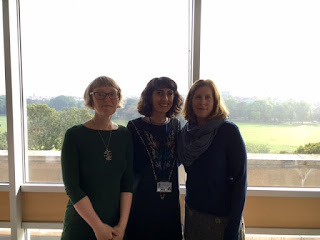 HARG is a group of archivists and records managers with responsibility for health records across the UK that come together a couple of times a year (usually once in London and once somewhere else!) to discuss shared issues and brief each other on changes in legislation and how they will impact on the records in our care. The membership is a bit wider than that though – anyone with an interest in health records and the history of medicine is welcome to join. We were pleased to invite the group to the Centre for Research Collections for their ‘somewhere else’ meeting this year, and spent a really interesting and informative day with fellow professionals. Much of the discussion was around HARG’s brand new website: how we would like the site to look and what information we want to include to benefit those using it as much as possible (http://healtharchives.co.uk/). But it was also a chance to catch-up on others’ news and developments as well as share our own. The afternoon concentrated on the Scottish perspective, and the group of us who look after NHS records in Scotland were able to introduce some of our work to ensure compliance with the Public Records (Scotland) Act and a conference we hope to run next year focusing on how NHS archives have been used in artwork and installations in Scottish hospitals to help patients and staff. Our Project Cataloguing Archivist, Aline, also talked about our case note cataloguing projects and there was time for those attending to take a behind the scenes tour and to have a look at our two current exhibitions, both of which draw heavily on the history of health and medicine (see our blog from 19 August for more info if you’d like to see them). What kind of hosts would we be if we hadn’t made time for some lunch…? Hi there, I’m Samar, LHSA’s current trainee! Seeing as I’ll be writing on here quite regularly, I thought it would be a good idea to introduce myself and let you know a bit about my background. I have always had a keen interest in history and heritage, studying Art History and English Literature at the University of Kent in Canterbury, as well as completing an MSc in Modern and Contemporary Art History, Curating and Criticism and at the University of Edinburgh. My academic studies have fuelled my passion for visual and written culture, history, and story-telling, also broadening my understanding of the politics of collection display, development and accessibility. Although my academic background in art history is not unrelated to the field of archiving, it wasn’t until I pursued an internship at Glasgow Women’s Library (GWL) that I began to truly appreciate the impact that archives have on not only our understanding of the past and present, but on our ability to imagine possible futures. During the internship at GWL, I gained first-hand experience working with an accessible archive that is targeted at diverse communities. 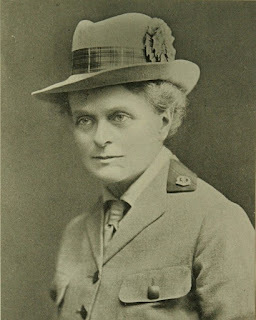 I quickly learnt that in collecting materials of women’s history, and running events and exhibitions that centred around these materials, I was not only actively redressing the neglect of women’s historical contributions to Scottish society, but I was also enabling women in the present, especially the most vulnerable and excluded women in society, to access the information that they need to develop their skills, knowledge, and self-confidence. Impassioned by what I had learnt at GWL, I attended a talk at the Feminist Library in London about the digitisation of their Spare Rib magazine collection. I was inspired by the website that was developed for the project, which was produced by the British Library, and features hundreds of issues of the magazine for all to view for free. This was an incredibly exciting prospect to me, because it meant that the Feminist Library’s archive materials could be discovered and accessed by large and diverse audiences that may not have had the opportunity otherwise. Encouraged by these experiences, I not only wrote my postgraduate dissertation on feminist counter-archival practices, but I also founded an online magazine with my sister Yasmine. My sister and I, who are both dually British and Arab, launched an online magazine on International Women’s Day which exclusively publishes artwork and writing by Arab women (www.dardishi.com). We created this platform, because we feel that the voices and experiences of Arab women are going largely unarchived. We believe that this is, unfortunately, because we live in a time where traditional archives and the media (both Arab and Western) do not represent us. We chose the name ‘dardishi’ (which is the feminine verb for ‘chitchat’ in Arabic), because the magazine’s formation was largely inspired by all the incredible conversations that my sister and I have had with our female Arab friends and family. The name dardishi also says a lot about the tone of the work that dardishi publishes – informal, conversational work that spurs a wider dialogue on Arab women’s issues. Since its launch, my sister and I have been overwhelmed by the incredible support and enthusiasm that we have had for this project! Although my studies and experiences are relevant to the archive sector, they have not equipped me with practical archiving skills. I’m very keen to gain training and experience in the field, so this traineeship at LHSA is the perfect opportunity for me. My 12-month traineeship programme is one of seven Scotland-wide traineeships offered this year as part of the Opening up Scotland’s Archives project. People like me have been chosen to complete these traineeships in an effort to diversify the range of people working in the heritage sector, introduce new skills and perspectives to archival practice, and offer people without traditional archiving qualifications a route into the workforce. I hope that through my work at LHSA, I can put my current knowledge to use, and develop new and exciting skills and experiences in the world of archiving. I’m keen to gain experience in both collection development and community outreach and engagement, and I can’t wait to work with the rich and varied materials available in LHSA’s holdings. With materials dating from 1594 to the present day, and a collection that includes clinical and non-clinical NHS records and personal papers, a photographic collection of around 40,000 items, as well as older printed books, medical instruments, artworks, silverware and other historically significant objects, I know I won’t be short of exciting collections to explore and catalogue. I actually found my favourite piece of LHSA archive material so far when researching for my interview on this very blog! In Becky’s post about the advice and recommendation of the doctors who worked at the Royal Victoria Dispensary (RVD), she explains that upon being diagnosed with tuberculosis, female patients were advised by doctors to stop going out dancing at night, to reduce excessive tea-drinking, to wear stockings, and to spend less time with their boyfriends! Examples of recommendations given to female patients who attended the dispensary. I’ve had the chance to start cataloguing some records from this collection myself this week, which has been great! Other collections that I’ve got my eye on exploring is the ‘Bruntsfield Hospital and Elsie Inglis Memorial Maternity Hospital’ collection, which contains records from hospices and hospitals founded by innovative Scottish women doctors and feminist campaigners, and the ‘Cervical Smear Campaign and Women's Health’ collection, which covers the feminist campaigns that women organised in order to encourage their local heath councils to take a wide-ranging look at factors affecting the mental and physical health of women in Scotland (that didn’t have to do with stockings, dancing or tea-drinking!). I’m thrilled to have been chosen for this opportunity, and I’ve been so excited to come in to the archive every day and work with such a lovely team of people and such an amazing collection of objects. Watch this space to hear about what I’m learning and what boxes I’m delving into! Inspired by the current exhibition in the Binks Display Wall on the 6th floor of the Main Library, this week Rebecca takes a closer look at the history of one of the items on display, the inhaler. Inhalation of smoke and steam from therapeutic plants has been used to treat chest problems since ancient times, but in Britain it really grew in popularity from the nineteenth century. Not all of the inhalations were what we might expect; tobacco and anti-asthma cigarettes including anti-spasmodics such as stramonium were popular cures, despite what we now know about the dangers of smoking with regards to chest diseases, and folk cures for diseases such as whooping cough involved things like holding the head of the infected child in a hole in the ground to breath in the scent of the earth, getting them to breath the air in in gas works or coal mines, or breathing into the mouths of various animals. A Dr Nelson's inhaler, held in the LHSA Object Collection. Probably more effective, and certainly more pleasant, than breathing into a frog's mouth! Inhalers first took off in the 1840s as a means of anaesthesia, using ether or chloroform. Soon, however, they were being used with different substances for the treatment of respiratory conditions, including phthisis (tuberculosis) and asthma. 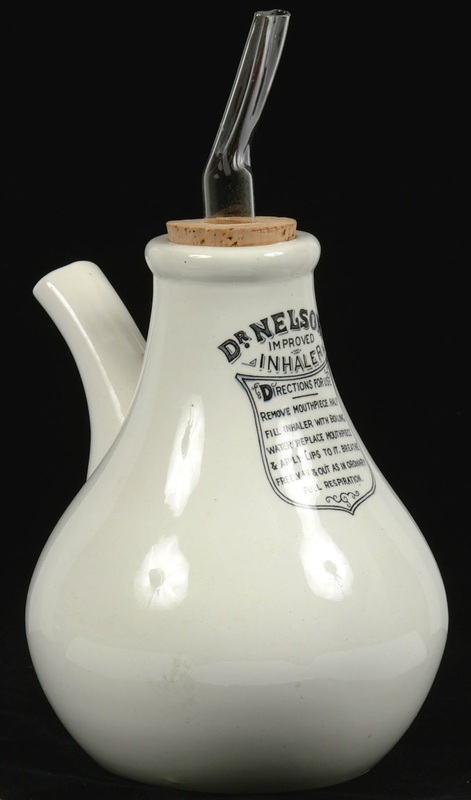 Dr Nelson’s inhaler, launched in the 1860s, is one of the most recognisable examples of the kinds of inhalers which were developed in this period. Boiling water is poured into the bowl of the ceramic inhaler, where it can be blended with soothing and medicinal substances. The resulting vapour is inhaled normally through a glass spout, taking the vapour directly into the lungs. Inhalations were quickly accepted as an effective treatment by the medical community, being formularized in the British Pharmacopoeia in 1867. In the twentieth century, the ideas behind inhalation were further refined, leading to the clinical development of medicines which could act as bronchodilators and steroids when inhaled, and improved methods of delivering them. The Royal Victoria Dispensary occasionally recommended ‘inhalations’ for patients with breathing difficulties in the first half of the century, showing the continued popularity of this method of treatment. Asthma inhalers as we would recognise them today were first marketed in 1969, after a team led by Scottish pharmacologist Sir David Jack developed salbutamol, a bronchodilator, marketed as Ventolin. Our inhaler on display as part of the Enhance, Access and Understand exhibition. We have a Dr Nelson’s inhaler on display as part of an exhibition in the CRC, “Enhance, Access and Understand: The University of Edinburgh and the Wellcome Trust”, which runs until 31st October. 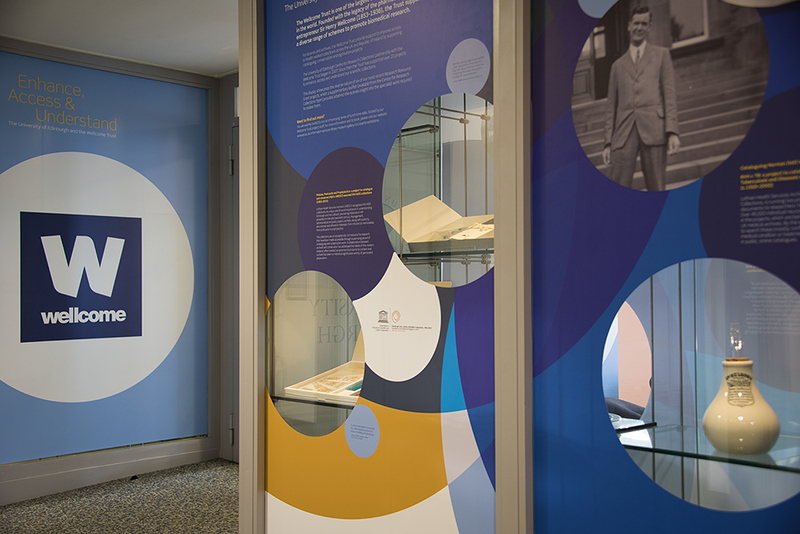 This exhibition celebrates the recent Wellcome Trust Research Resources funded projects undertaken at the Centre for Research Collections, including the RVH v TB and Norman Dott case note cataloguing projects and the HIV/AIDs project at LHSA. A series of talks will accompany the exhibition. The exhibition is free, and is open Monday – Friday, 9-5 on the 6th floor of the Main Library. The talks are also free to attend. For more information on the exhibition and all of the talks, see http://www.ed.ac.uk/information-services/library-museum-gallery/crc/events-exhibitions/events. LHSA staff will be delivering two talks: Ruth and Emily will be talking about the conservation of the HIV/AIDs collection on 21st September, and Louise will be giving a presentation about the case note cataloguing projects on the 19th October. It's free to attend, but you'll need to register on Eventbrite. Hope to see you there! Hand, W.D. (2012) ‘Folk Medical Inhalants in Respiratory Disorders*’, Medical History, 12(2), pp. 153–163. doi: 10.1017/S002572730001303X. Jackson, M. (2011) ‘“Divine Stramonium”: The Rise and Fall of Smoking for Asthma’, Medical History, 54(2), pp. 171–194. doi: 10.1017/S0025727300000235. Colin Smith has recently finished an MSc in Book History and Material Culture at the University of Edinburgh. He began volunteering with LHSA back in October of 2015, and has most recently been working with the Craigleith Hospital Chronicles, a World War One military magazine, printed for injured servicemen who were recuperating from war injuries in Edinburgh. In honour of the one-hundredth anniversary of the First World War, Lothian Health Services Archive revisits the Craigleith Chronicles from 1916 in order to record the names of people who regularly contributed to the making of the Chronicles. Many of the contributors were either patients or staff members associated with the 2nd Scottish General Hospital, a local hospital located north of Edinburgh City Centre. This blog post highlights some of the interesting stories that Colin has come across working with the Chronicles. 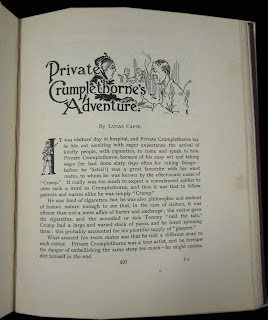 One of the more lively characters featured in the Craigleith Chronicles was soldier patient, Private Crumplethorne. Written by Lucas Cappe, the Crumplethore series told captivating tales of time on the battlefield. On first glance, his stories seem to be filled with one of courage, bravery, and gallantry-- nothing short of a distinguished serviceman reliving his experiences of time in war! 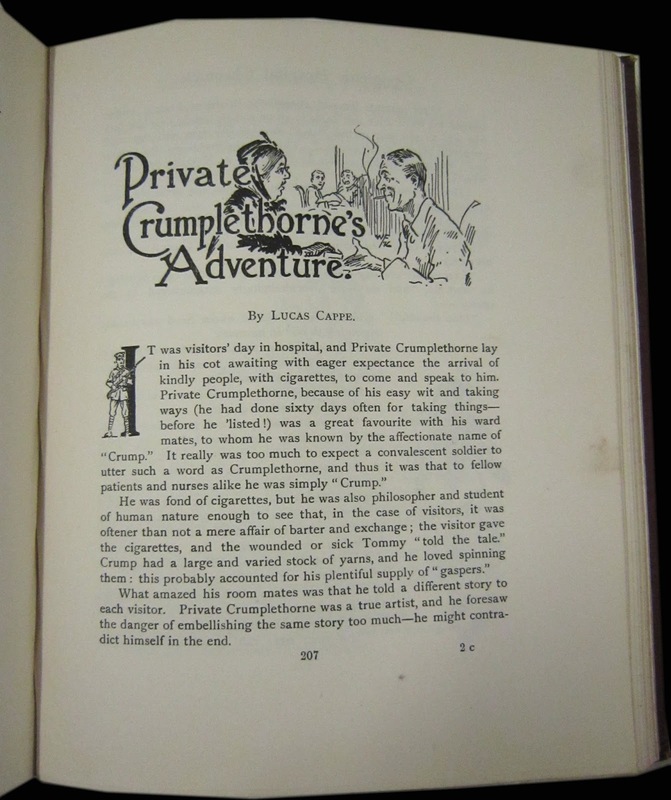 For the more familiar subscriber, especially those who live in the same Ward with Cappe, his stories show signs of a great storyteller who entertained countless staff, fellow soldiers, and first-time listeners of his tales. More business-like, the Craigleith Chronicles circulated “Hospital Notes” in every subscription. 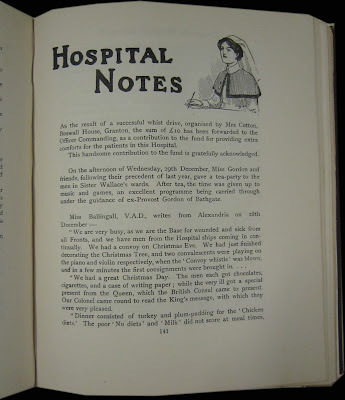 The “Notes” brought readers up to speed with some of the past proceedings of the Hospital. Most of the time, the “Notes” recapped popular events like when distinguished staff members of the armed forces visited the Hospital. Other times the “Notes” updated readers on new building projects such as the construction of the Recreation Hut, gifted to the Hospital by the Red Cross Society in 1916. The “Notes” reported on staff changes too, noting which staff were called overseas for service and who would replace their spot. While the “Notes” wished the best to staff who were departing overseas, some months, it sadly had to bid farewell to friends and family of the Hospital too in “The Roll of Honour” which listed men and women who were killed while serving on the battlefront. One of the most enjoyable parts of the Chronicles that I think captures the essence of the staff and soldiers might very well be the drawings sketched by soldier patients for the magazine. One example particularly stands out from the rest: the drawings by Sapper George Bain who sketched a humorous comic strip for the November 1916 issue. 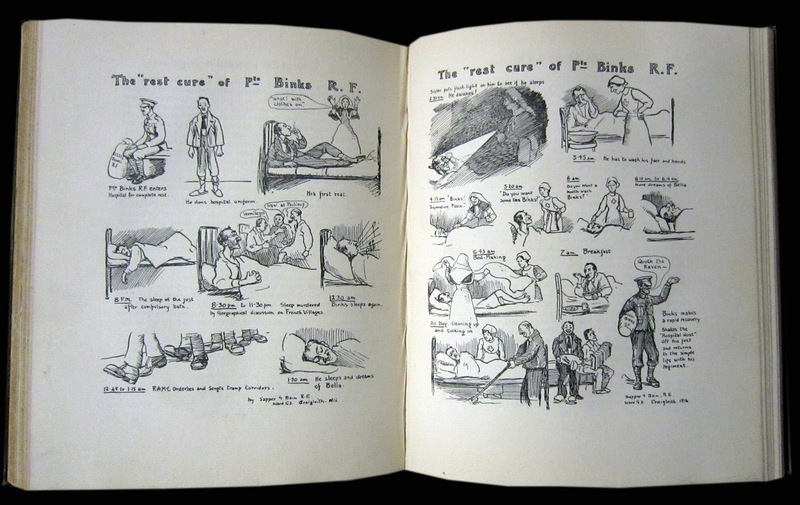 The comic strip shows one full day in the life of Private Binks, presumably a fellow patient. From the time Binks came to the Hospital, the comic strip portrays the nightly noises that wake Bink from his sleep. 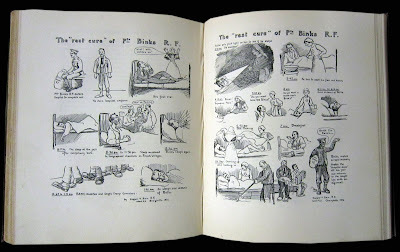 From the geographical discussions on French towns in the wee hours of the night, the RAMC trampling through the loud corridors, the flash-light being shone onto Bink’s face to see if he is sleeping to the mandatory making of the bed by staff early in the morning, the comic strip shows the playful side of a soldier recuperating from his war injuries. On a more personal note, however, I contend the drawings show the endearing comradeship of one soldier to the next. It is this image that I wish to close on in this blogpost. To see how something so small as a hospital magazine played a significant role in the lives of those who served in the First World War is what makes this project so crucial for the one-hundredth anniversary observance. LHSA would like thank our wonderful volunteers Colin, Aidan, and Arianna for all their help on this fascinating resource.